Sharanam – An Integral Approach to Sustainability | Fourth Dimension Inc.
‘Sharanam’, a purpose-built training centre for rural development. Sharanam is designed as a training and administrative centre of a larger rural development programme initiated by SAS in the surrounding villages of Villupuram district, Tamil Nadu. Sharanam will be the main venue for a variety of programmes in rural development covering a range of topics including rural health and hygiene, sanitation, education, income-generation, teacher training, self-development among women, youth and children facilitated through psychological development. The ‘Sharanam’ land is a 5 acre plot located 10 kms west of central Pondicherry. Jateen Lad is an architect who has practised in London, across Europe and East Africa. He studied and taught architecture at the Universities of Cambridge, Harvard and MIT. Trupti Doshi is an architect from Mumbai where she has held an independent practice. Both architects have a core belief in sustainable and ethical building and environmental practices. Both have relocated to Pondicherry to work on the design of Sharanam on a voluntary basis and are actively involved hands-on in all site operations and training. The principal facilities at Sharanam include a multipurpose hall (maximum capacity 150), administrative offices, library, computer room, demonstration technologies, stores, kitchen and washrooms. To build a unique, inspirational and green building suited to a rural context. To restore the ecological landscape of the site scarred due to illegal mud quarrying. To construct a modern highly-engineered superstructure using earth as the primary building material and minimize the use of steel and cement. To upgrade the skills of local workers from the village and employ them in the meaningful creation of the Sharanam training centre FOR THEM, WITH THEM. Stopped illegal mud quarrying and restored the ecological landscape of site. Concerted efforts at soil healing through plantation of new indigenous flowering trees nurtured by organic methods, bunding and mulching. Revival of a local drip irrigation system has reduced the irrigation water requirement by 75%. Water conservation through ground water recharge wells, trenches and contour bunds. Surface run-off being diverted to a reservoir for re-use in irrigation. Top soil from areas demarcated for construction carefully removed and stored separately for use in gardening. Not a single tree has been cut – the entire building has been designed around existing trees. 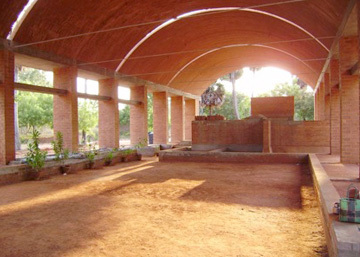 The design of Sharanam has been inspired by the careful study of traditional Tamil buildings viz; temples, Chettinad houses and local vernaculars, all of which demonstrate a strikingly similar response to the year-round hot and humid climate of Tamil Nadu – shade from the intense heat and maximizing ventilation to combat the high humidity. Several solar passive strategies have been employed to achieve thermal comfort in Sharanam. Some of them are: building orientation perpendicular to the predominant summer breeze, evaporative cooling through water bodies, effective use of piers for funneling breeze, large fenestrations, increasing the height of the building and roof overhangs for maximising ‘stack effect’. The Focus: To minimize the use of energy guzzling and environmentally polluting materials (such as steel, cement and reinforced concrete) and fittings (such as air-conditioners) and demonstrate use of environmentally responsive materials and sustainable technologies. Rammed Earth foundations: Foundation pits were precisely dug and the same excavated earth was sieved, mixed and rammed back to ensure zero wastage of raw material. No soil has been brought from outside. Compressed Stabilised Earth Blocks (CSEBs): Earth from the lowest point on site has been used to manufacture almost 100,000 custom-made CSEBs – stabilized with only 5% cement – of 9 different sizes for the main superstructure which includes a large 9.5m span earthen vault. Soil for these blocks came from a small area measuring 9 x 15 x 1.5 m which is integrated into the design as the surface run-off reservoir. Precision: From the scale of the individual building blocks to the huge superstructure, the project has been executed to a precision of 0.5mm. Optimization: The aim is to design and construct the strongest possible roof, beam, foundation etc. using the least amount of material. E.g. the main roof – a segmental vault in earth – 9.5m span and 42m long – has been built with 36,850 custom-made CSEBs with the roof thickness reduced to only 9 cm at the key stone. The CSEB masonry uses stabilized earth mortar – 1 mm in thickness which has allowed the 140 tonne roof to be built using only 33 bags of cement. Water: Extensive scheme for rain water harvesting including segragation of roof-top and surface run-off. Roof-top water to be stored separately and recycled for potable purposes. Sanitation: Waste from green toilets and kitchen to be treated and recycled for irrigation. Zero Waste: Construction methods used ensure zero construction waste. Finally and most importantly, at Sharanam, we believe that ‘Green building’ is not just a finished product that can be quantitatively evaluated through carbon emissions or numbers in energy audits. It is the qualitative expression of a process of building that constitutes green architecture. It is the integral approach towards building Sharanam which includes not only the cultural and climatic context of Tamil Nadu and technological context of sustainability, but also the wider human dimension and the social context of rural development which have contributed to the ‘greenness’ of Sharanam. Here, the act of building is seen as a means of self-development for all concerned. Redefining the role of the architect as a hands-on professional engaging in the wider, inter-disciplinary context of development. Instilling the wider values of ‘modernity’ into the process – quality, precision, discipline and organization. Contrary to general building practice, Sharanam does not have a contractor. This removes the heavy percentage cuts (30%) taken by brokers and ensures all workers receive their due wage on time. Instead, the architects are leading the construction by training local unskilled workers from surrounding villages during the process of construction. Skilled local workers e.g. masons, have their skills upgraded and introduced to new techniques and higher standards of work. The cost of the unique superstructure is 40% cheaper than conventional reinforced concrete buildings. Sharanam has been chosen by the United Nations Environmental Programme (UNEP) as one of four case studies for sustainable buildings in India.